I'm working on the translation update for Larousse Gastronomique and a recipe calls for courgette violon. Does anyone know the English equivalent? Can't find it anywhere! Or at least a description as to why a recipe would specify this type? Would be most grateful. Hello Laura, and welcome to the forums! 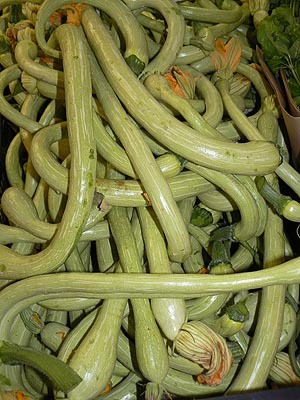 I had never heard of the courgette-violon, but after a brief research, it seems to be a popular variety in Provence, that is supposedly more flavorsome than the ordinary courgette, and also called courgette-trompette. Here's a picture I found: http://farm2.static.flickr.com/1275/1167501263_0c9581a177_o.jpg . I can't, however, offer an English equivalent. Posted: Mon Sep 29, 2008 5:23 pm Post subject: thanks! Thanks so much, this one really stumped me and I couldn't find any photos myself. Have a look at this link, I found it in a seed catalogue and I think that's as close as I can get in English. A courgette trompette is basically an elongated zucchini... nothing too special about it other than the shape. You can use your regular sold-on-america zucchini on any recipe and it won't be a big problem. I never quite understood why they call it violon as well as trompette... closest I can get is the violon bow, cause they certainly don't look like the violon itself. And clotilde, I love your blog! That's an awsome pic... some LONG zucchini there!